Type in quantity desired then click "Add to Cart! Crafted from Premium Mahogany and White Maple, our Wooden Tournament Chessboard is imported from Europe and is the choice of Chess professionals all across the world. It is regularly used at all level of chess tournaments, from local Chess clubs to the FIDE Chess Olympiad. 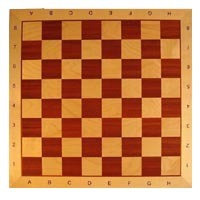 These boards have been used by the likes of Garry Kasparov, Anatoly Karpov and virtually all professional Chess players. The board is very attractive and includes rank/file labels around the frame, making it an excellent training tool. It looks great with both Plastic and Wooden Chess pieces. Manufactured by the House of Staunton, with the HoS company logo located on the h1 square.